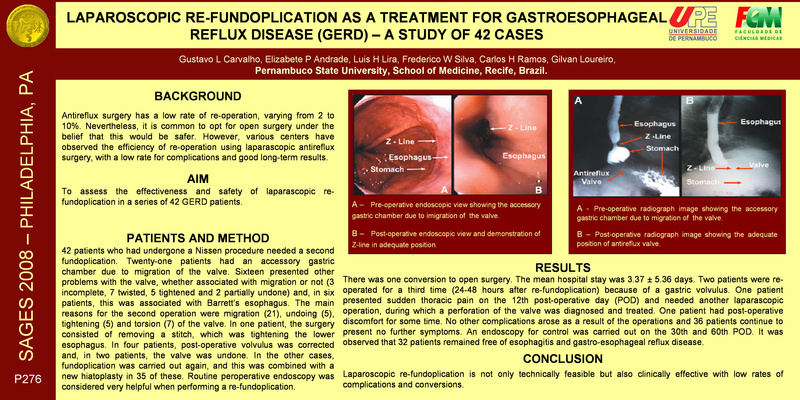 Laparoscopic Re-fundoplication As a Treatment for Gastroesophageal Reflux Disease (gerd) – a Study of 42 Cases. BACKGROUND: Antireflux surgery has a low rate of re-operation, varying from 2 to 10%. Nevertheless, when this is necessary, it is common to opt for open surgery under the belief that this is safer. However, various centers have observed the efficiency of re-operation using laparascopic antireflux surgery, with a low rate for complications and good long-term results. AIM: To assess the effectiveness and safety of laparascopic re-fundoplication in a series of 42 GERD patients. METHOD: Between 1990 and 2007, a study was carried out among 42 patients (22 of whom were men; with a mean age of 46.0 ± 16.37 years) who had undergone antireflux surgery using the Nissen procedure and needed a second fundoplication. In all cases, endoscopy, manometry and fluoroscopy was carried out. Twenty five patients had esophagitis of varying degrees. Twenty-one had an accessory gastric chamber due to migration of the valve. Sixteen presented other problems with the valve, whether associated with migration or not (3 incomplete, 7 twisted, 5 tightened and 2 partially undone) and, in six patients, this was associated with Barrett’s esophagus. The main reasons for recommending the second operation were migration (21), undoing (5), tightening (5) and torsion (7) of the valve. In one patient, the surgery consisted of removing a stitch, which was tightening the lower esophagus. In four patients, post-operative volvulus was corrected and, in two patients, the valve was undone. In the other cases, fundoplication was carried out again, and this was combined with a new hiatoplasty in 35 of these. Routine peroperative endoscopy was considered very helpful when performing a re-fundoplication. The patients were later assessed by way of endoscopy, fluoroscopy and biopsy. RESULTS: There was one conversion to open surgery. The mean hospital stay was 3.37 ± 5.36 days. Two patients were re-operated for a third time (24-48 hours after re-fundoplication) because of a gastric volvulus. One female patient presented sudden thoracic pain on the 12th post-operative day (POD) and needed another laparascopic operation, during which a perforation of the valve was diagnosed and treated. One male patient had post-operative discomfort for some time. No other complications arose as a result of the operations and 36 patients continue to present no further symptoms. An endoscopy for control was carried out on the 30th and 60th POD. It was observed that 32 patients remained free of esophagitis and gastro-esophageal reflux disease. CONCLUSION: Laparoscopic re-fundoplication is not only technically feasible but also clinically effective with low rates of complications and conversions.